They are a lot bigger than that now. Their bodies are coated with feathers, but their necks and heads are still mostly fluffy chick down. 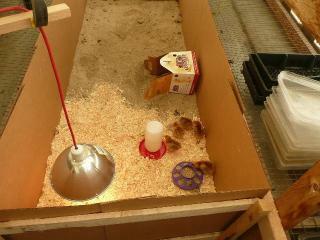 Each day, though, the Rhode Island Reds are getting brown-red speckles on their heads. All of the chicks enjoy flying short distances, although they are not very adept at it. 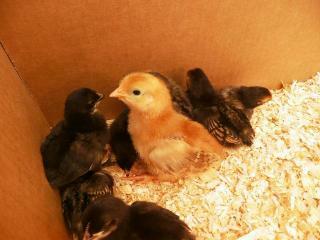 We think one of the Rhode Island Reds is a frizzle, because her feathers curl up at then ends. Since we can tell her apart from the others, she is the first one we have given a name. Only about one in every 48 chickens becomes a frizzle. 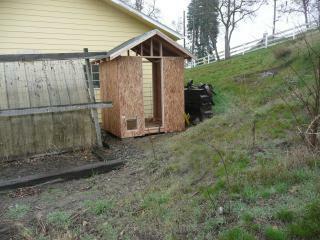 Since they are growing so fast, one of the relatives has been working his tail off making the chicken coop. It's almost done!